After writing about Bow Roundabout in London a week ago, I looked around and found other people had done the same. However, at least two had proposed what is very much the wrong solution. The idea of a "Turbo Roundabout" came up on both the Cyclists in the City and Pedestrianise London blogs. It's not the right solution. Sometimes you have to be careful what you wish for. If you're not absolutely sure what a Turbo Roundabout is (in particularly, a "turbo-roundabout" as might be implemented by TfL) and not absolutely sure that it is what you want, then don't ask for one. Indeed, the whole point of the turbo roundabout is to "improve traffic flow". Turbo-roundabouts were never intended to make things better for cyclists or pedestrians. Cyclists don't much like them. The Fietsersbond (Cyclists' Union) in the Netherlands has complained about unacceptably long crossing delay times for cyclists at Turbo Roundabouts. Note how crossing double exit lanes causes trouble for cyclists. So what's the alternative ? I didn't have any photos or videos of my own to show here because we don't have turbo roundabouts in this area. In fact I've documented before what all the roundabouts in Assen look like. None are turbo roundabouts, and none cause problems for cyclists. Some other ideas are pointed to by the website set up by people who are campaigning to improve or replace the Floraplein turbo-roundabout. It includes a link to an interesting presentation about alternatives to turbo-roundabouts written by Peter Kroeze of Ligtermoet and Partners. When observing from afar it can be difficult to tell what really works from what does not work. We've already seen both shared space and strict liability given far too much credit for the cycling conditions in the Netherlands. Let's not add Turbo Roundabouts to the list of things that are misunderstood. If you want to know what real Dutch cycling infrastructure is really like, why it works, and why cycling is so popular and so safe here, please book a study tour. Not many people have the experience that we have of living and cycling in two countries as different as the UK and the Netherlands, and we can pass a lot of this knowledge on within a few days. Reading blogs like this, reading articles and looking at Google Streetview can only get you so far. A year after posting this blog post, warning that Turbo Roundabouts, no matter how attractive the name sounded, were never intended to be used by cyclists, a story appeared about the "walking and cycling officer" of Bedford in the UK was proposing to use "Dutch experience to improve cycle safety" by building a turbo roundabout which is actually worse than the example from Eindhoven shown in the video above because there is to be no cycling infrastructure at all. which have never been used before. for something more worthwhile ? On the Bedford turbo roundabout, cyclists are supposed to either share the road with cars or to cross the road like pedestrians. They are branding this as "Dutch" even though it is something which you would absolutely never see in the Netherlands. Frankly, it's difficult to imagine a larger mistake than this. This recalls an online conversation which I had in 2011 with another Bedfordshire planner. He also wanted to build a "Dutch" roundabout which omitted cycling infrastructure. Various reasons why were given, including the "difficulty" of combining existing on-road cycle-lanes with a Dutch style roundabout which had cycle-paths and his idea that "not all" Dutch roundabouts had separate cycle-paths. The discussion with the Bedford planner prompted two blog posts from me to illustrate what I had said to him in email. One of these posts demonstrated that there is no problem at all in merging from an on-road cycle-lane onto a properly designed Dutch roundabout. 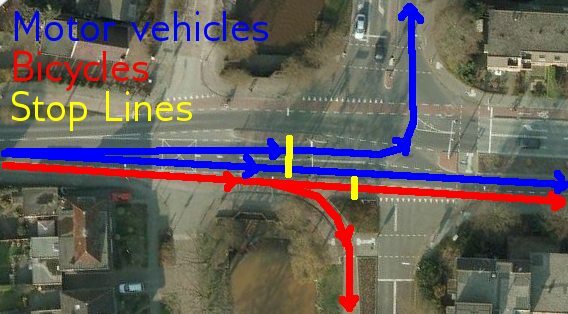 The other post demonstrated how every single roundabout in Assen has separate facilities for cycling because that is the norm in the Netherlands. His concept of a "Dutch" roundabout without separate cycling infrastructure was not similar to real Dutch infrastructure. Cycling infrastructure is not an optional extra on roundabouts. Where cyclists have to use the same roundabout junction, specific infrastructure must be provided. It's disappointing that after having had this long conversation and tried to explain to one Bedford planner, another should still have similar misconceptions two years later. Note that the first Bedford planner also pushed through his flawed ideas, building a dangerous design of roundabout branded as "Dutch" in Cambridge. Despite my warning and others, this project continued. Further investigation by myself in 2014 revealed that the Turbo Roundabout in Bedford had been signed off by representatives of several British cycle campaigning organisations: Tony Russell (Sustrans), John Franklin (Cycle Nation), Chris Peck (CTC), Ruth Jackson (British Cycling), Ralph Smyth (CfPRE) as well as Robert Semple (Transport for London). It's extremely disappointing to find that campaigners have such low aspirations as to rubber stamp a proposal which is as dangerous for cyclists as this roundabout design. A downloadable report is now available about this roundabout. One image, along with its caption, is shown on the right. I recommend reading the report in full. 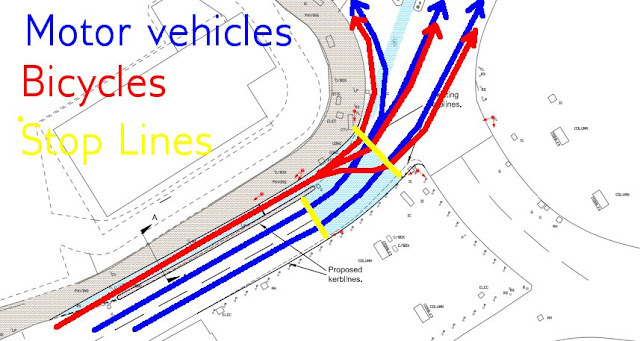 Amongst other conclusions, it is said that "Arrangement of cycle crossings maximises possibility of conflict between cyclist and pedestrian"which shows the many problems caused by the design used in Bedford. This mistake should not be repeated. Find out about proper infrastructure designs. 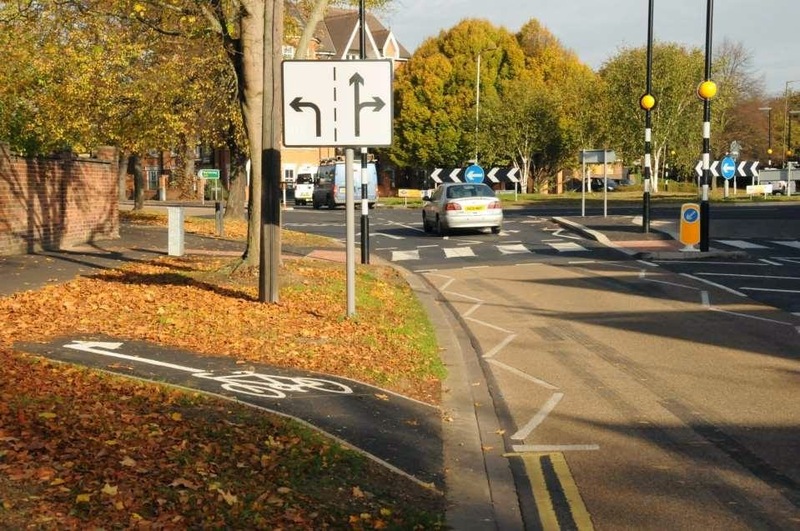 We run cycling infrastructure study tours precisely in order to try to help councils like Bedford to not make such expensive and dangerous mistakes as this one. Planners need to be educated. They need to learn from the best examples and not just guess at what they think best practice might be. We'd be very happy to host a contingent from Bedford if they'd like to see what the Dutch really do so that future "Dutch" innovation in Bedford can be inspired by the real Dutch infrastructure. The British arm of a Dutch based company has proposed turbo roundabouts for the UK which I believe would not be built in the Netherlands. Read a blog post about this, including pictures of real Dutch Turbo Roundabouts. Also read a blog post which summarises several things which are "Dutch" but which should not serve as inspiration. Assen is building a turbo roundabout to serve a motorway junction in the south of the city. As such, it is correctly being built in a place where there are many motor vehicles but where neither pedestrians nor cyclists have any reason to go. Watch a video showing this roundabout and how difficult it is even to get near it by bicycle. Several bloggers have covered that London is considering changes to the very busy and lethal Bow roundabout. Their website says that they are "redesigning cycle facilities at Bow roundabout, East London, to improve safety for cyclists." I first saw this image a few minutes after returning from the centre of Assen. As it happens, on our most direct route to the centre of the city, I pass a junction which looks remarkably similar to a mirror image of what is being proposed in London and I thought I had to write about the similarity. However, these two junctions are not as similar as they look. The junction in Assen works because proper cycle paths lead into itn and because it's on a relatively lightly used street. This area is nowhere near so busy as Bow roundabout. The raised kerb between the cycle-path and road protects cyclists at the junction instead of disappearing just before it. The Assen junction solves problems which the London junction will suffer from - notably the ability of drivers to intimidate cyclists and to turn across their paths. The design in London requires drivers to turn left immediately after the traffic lights, crossing the route of cyclists, in order to reach some destinations. 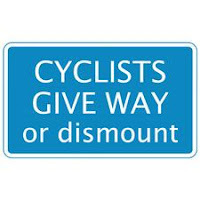 Cyclists in London are also encouraged to take up position at the right in a wide bike box depending in order to turn across the motor vehicles to make a right turn. London's junction actually has two sets of traffic light, virtually guaranteeing a red light for approaching cyclists in a vain attempt to make sure any bikes in this location get away before the cars. Assen's junction completely removes all conflict. The Assen junction is not part of a roundabout. At no roundabout in Assen are cyclists expected to mix with No Assen roundabouts have lanes on road. Not one of them include a bike box. Not one of them puts cyclists in a position such as is proposed in London. I don't much like advanced stop lines (aka "bike boxes"). Cyclists filtering through traffic to reach a bike box can find themselves an unpleasant situation on the wrong side of turning vehicles when the lights change. They can be subject to intimidation by drivers behind them, and upon reaching the bike box a cyclist can find that it is already full of cars or motorbikes. On a small road with few motor vehicles, they can just about work. On a multi-lane road like this, there are far too many points of conflict where cyclists and drivers will have to cross each others' paths and they should not be considered. It's a world away from sustainable safety principles which remove conflict and makes roads self explanatory in order to reduce the chance of collision. Bow redesign includes plenty of scope for conflict between cyclists and drivers "sharing" a giant roundabout together. Not only the routes but also the speeds are different, leading to many points of conflict. Bike boxes are still sometimes seen as aspirational in other parts of the world, but far from being an ideal to aim for, they're actually one of the least effective measures that can be taken for cyclists. Bike boxes are increasingly uncommon in the Netherlands. I'm happy to say that we don't have any bike boxes in Assen. Therefore, the junction which I'm comparing with is different in many ways. However, it's the closest thing I can find locally to what is being proposed in London. And that brings us to perhaps the most important difference between these two junctions. While the mega-city of London sees it as aspirational to install a badly designed junction like this on a roundabout on an incredibly busy and complex junction to give cyclists a very slight advantage on a route which is for some reason called a "cycling superhighway", plans are afoot in small towns right across the Netherlands to remove older infrastructure like the Assen junction and make further improvements to remove conflict and give cyclists more convenient routes. This is happening in the Netherlands even on small junctions like this. Bike boxes are not something which should still be part of new designs, especially on busy junctions. Rather, they're an idea which both campaigners and planners should be looking beyond. This junction works for now, but its days are already numbered. Work on re-opening the canal starts this year, and very soon this short stretch of road will be dug up and replaced by a modern bridge. 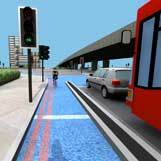 It is positive that TfL seems to be thinking about cyclists. We have to hope that their proposal of a redesign in the face of criticism is a sign that a positive change has taken place within the organisation. However, the proposal that they've put forward is inadequate. at Bow roundabout in London ? Where transport planning is concerned, London seems to be stuck 40 years in the past. This has to change, for the benefit of everyone. It's been shown more than once that not only cyclists but also drivers benefit from the building of cycling infrastructure and higher rates of cycling. No-one in Britain benefits from the low quality of infrastructure being installed in the country. Exactly the same problems arise in the Netherlands as in the UK, however the approaches taken to deal with them are very different. In the Netherlands, cyclists are not put into the firing line. Practices here are very much more advanced. We run infrastructure Study Tours here in Assen and Groningen to demonstrate how the infrastructure in this part of the world works to keep cyclists safe and make cycling popular. If anyone from Transport for London is interested in seeing a very different way of designing cycling infrastructure they might like to book a tour. Avoid confusion. Avoid wasting money and time on implementing second rate dangerous designs. Stop trying to re-invent the wheel. The junction in Assen featured in this blog post, a rare surviving relic of older design, is to be replaced and updated in the next few months. This junction in London was changed in the way that the city said it would and since that time it has claimed another life. There is a protest ride tonight (but note that London Cycling Campaign's suggested fix is very far from what is really needed). Before London can become a truly safe place to cycle it has to do a lot more than fix just one junction. Please TfL, send someone. We can show you how to create proper safe cycling infrastructure which works for everyone. The old Assen junction featured in the video above has been completely rebuilt and it is now possible for cyclists to make a totally safe left turn across traffic at the new junction. Please read a new blog post which includes a description and video of the new junction design. Read more posts about Advanced Stop Lines ( Bike Boxes ). Also note that one of the most important interventions with regard to traffic lights in the Netherlands is enabling cyclists to avoid them altogether.